You are currently browsing the archives for the Team Handball category. SnapSports® Athletic Surfaces is the official flooring of the 2013 USA Team Handball Club National Championships, to be held May 17-19 at the Reno-Spark Convention Center in Reno, Nevada. SnapSports multi-patented sports surfacing is the preferred tournament surfacing of USA Team Handball and the top performing sports flooring in the industry. The USATH 2013 Club National Championship is the largest annual Handball competition in the country. Teams from across the nation will diverge on Reno to participate in this championship tournament during the course of which, the best among them will be decided. The athletes will play at the Reno-Sparks Convention Center on over 30K square feet of SnapSports multi-patented Revolution ShockTower® surfacing. SnapSports multi-patented Athletic Surfacing, the official surface provider for USA Team Handball, is the top rated sports flooring in the industry. Engineered specifically with safety and performance in mind, SnapSports products offer unmatched durability and traction while featuring superior shock absorption using the patented ShockTower® technology. ~ Jorgen Moller – CEO, SnapSports Inc. The University of Puerto Rico’s Rio Piedras Campus has retro-fitted their gymnasium with 18,000 square feet of the multi-patented SnapSports BounceBack® flooring with ShockTower® technology. The existing surface consisted of polyurethane over recycled rubber that was tired, worn, and considered unsafe for sports play. ‘ABC Sports’, the authorized dealer for SnapSports® Athletic Surfaces in Puerto Rico, removed the old gym floor and prepared the concrete to receive the new high-tech SnapSports surfacing. The arena is heavily used by students and top athletes for volleyball, basketball and team handball. It is the largest SnapSports project in Puerto Rico to date. “This campus is the University of Puerto Rico’s biggest of 12 additional campuses around the Island. The games that are played on these courts draw a lot of attention from the sports reporters and media in Puerto Rico. The male National Volleyball Team that represents Puerto Rico in every competition around the world has made these courts their home base for their practices. The head coach for the National Team, Mr. David Alemán, as well as the players, is extremely pleased with the new SnapSports ShockTower® surface.” – Abid Quinones, President ABC Sports. SnapSports ShockTower® is an exclusive patented technology delivering top rated performance and safety through 16 individual shock absorbers per square foot within the sub-structure of the entire floor. The ‘Shocks’ provide an added level of “cush” to help prevent injury during aggressive play by reducing impact on players joints and limbs. “I’ve met several times with the university’s athletic and recreation department managers. They all had 100% faith and trust in ABC Sports and their ability to deliver the best surface for UPR’s student athletes. They couldn’t be happier with their floor.” – Robert Dougherty, International Sales Manager, SnapSports, Inc.
SnapSports®, the world’s leading manufacturer and supplier of premium modular sport surfaces, and official flooring of USA Team Handball, has been officially recognized and approved by the International Handball Federation. The administrative and controlling body for International Team Handball has certified SnapSports surfacing as meeting international and IHF standards. Handball, a team sport formed at the end of the 19th century, pits two teams of seven players against each other, with the purpose of scoring in the opposing team’s goal. Handball games are played primarily in indoor sport facilities, on indoor sport surfacing. Formed in 1946, the International Handball Federation has been the organizing body of Championship Handball play since the end of World War II. The IHF is composed of approximately 795,000 teams and 19 million players worldwide. “We’re excited to be recognized by the IHF, the world governing body for team handball, as a supplier of quality sports flooring. This new approval will greatly impact our sales and marketing efforts in the many markets outside the U.S. and is a strong complement to our long standing endorsement as the official playing surface of USA Team Handball.” – Robert Dougherty, SnapSports. SnapSports multi-patented Indoor BounceBack Shocktower® surfacing is engineered to accommodate aggressive play, provide unmatched traction and durability, and meet the unique demands of the sport of Handball. SnapSports exclusive ShockTower® Technology ensures a consistent playing surface; excellent coefficient of friction designed to keep the surface in place, and is guaranteed to reduce the impact on athletes’ joints and limbs by being engineered specifically with performance and safety in mind. 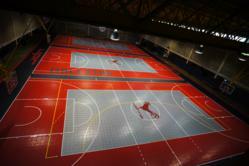 SnapSports® Athletic Surfacing, the industry leader of the modular sports surfacing industry, will provide the official flooring for the 43rd USA Team Handball National Championships, being held May 13-15, 2011 at the Salt Palace Convention Center, in Salt Lake City, UT. The three-day tournament, will feature competition in three different divisions, for which all of the games, will take place on SnapSports®, patented BounceBack® surfacing, manufactured specifically for durability during competitive play. By the end of the event, two teams will walk away as the 2012 Men’s and Women’s Championships. Utah will become the 17th state to host the Nationals event, which was originally held in 1968 in Long Island. The selection of Salt Lake City as the host city, was not surprising, as USA Team Handball’s national governing body, recently moved and established it’s headquarters in Utah’s capitol city in 2005. The 2nd annual Big Apple Handball World All-Stars Tournament will be held this January 1-2, 2011 In New York City’s Riverbank State Park Pavillion. Top professional teams will be competing on the multi- patent SnapSports® ShockTower™ Team Handball sports flooring, the official flooring of the United States Futsal Federation ( USFF). HANDBALL, widely known as Team Handball in the United States, is played in 159 nations by 39 million people. Many people link elements of basketball, soccer and lacrosse to the sport. It is fast, physical and exciting. Competition consists of two teams, composed of six players and one goalie each, facing off on a court approximately 66 by 131 feet. Players dribble, pass and shoot a ball into a goal. It is a very fast, exciting and aggressive player-on-player contact sport, and the SnapSports® Bounceback surface is designed to absorb player impact during aggressive play. The tournament will showcase World All-Stars Vs. German All-Stars with some of the greatest names in Handball, such as Jackson Richardson, HANS Wislander and MIRZA DZOMBA to name a few. This is an event not to be missed. The tournament will be televised live on EUROSPORT TV in over 50 countries.